Making your own Vegan Parmesan Cheese is extremely easy and only requires 5 ingredients! It’s a delicious dairy-free alternative to traditional parmesan. 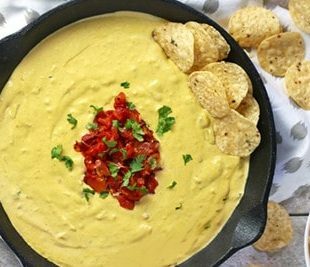 There’s no need to miss cheese when going plant-based. Believe me, I know it can seem impossible at first but if I can do it, you totally can (I was a previous cheese-a-holic and had my own cheese drawer in the fridge). One of my favorite things to do is recreate some of my favorite cheeses so I can enjoy them again. I’ve already made Chipotle Queso, Port Wine Cheese, Tofu Feta, Vegan Mozzarella, and of course my creamy Cashew Mac & Cheese. 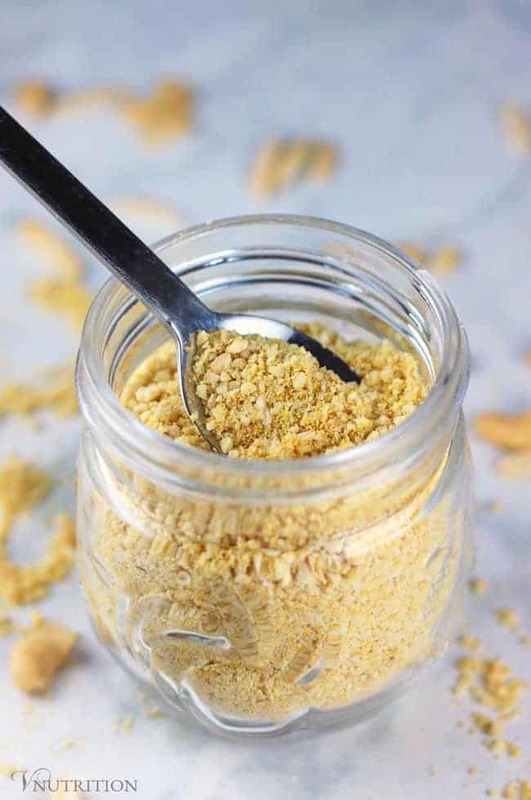 I’ve been making my Vegan Parmesan Cheese for years and wanted to share it with you because it’s so easy to make and perfect for topping pasta, vegetables, vegan pizza or anything else you’d use traditional parmesan cheese. I’d recommend this vegan parmesan to anyone who is plant-based but also those that have issues with cheese like those with lactose or casein allergies and intolerances. The difference between these is lactose is a sugar and casein is a protein in milk. People can have problems with either (or both). 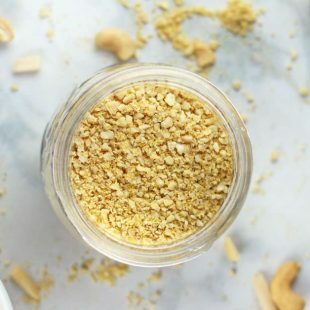 This non-dairy parm contains vitamin B12 from the nutritional yeast as well as provides good doses of protein as well as magnesium from the almonds and cashews. I can’t really say enough about this vegan parmesan cheese. It’s really tasty, takes about 5 minutes to make, and only uses 5 ingredients. I make a double batch probably once a month and give half to my husband and save half for myself. I actually hide mine in the back of the fridge (don’t tell him). You might be wondering why we split it, well it’s because my husband throws this on just everything and uses his batch in about a week. Yes, I know it sounds bad to hide things from my husband but if you knew him, you’d hide some things too (otherwise you’d have nothing to eat). I hope you love this recipe as much as I do. If you try it, please come back and leave me a comment below with your feedback and rating. 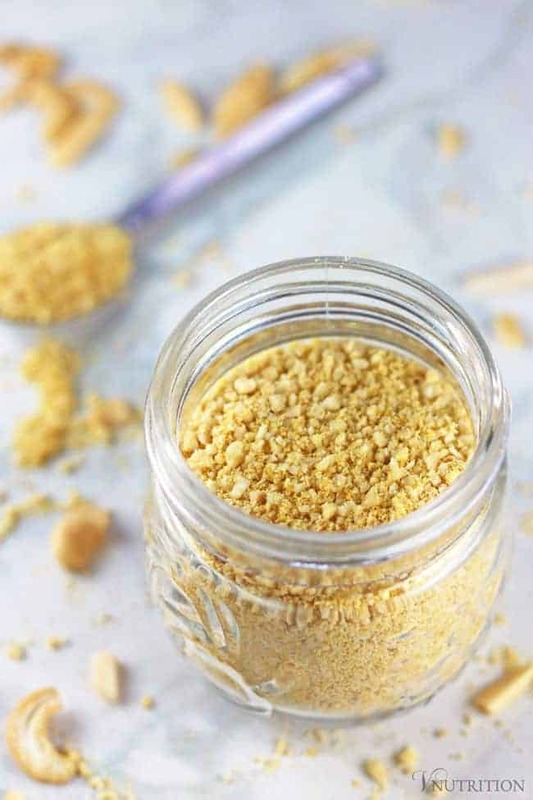 Making your own Vegan Parmesan Cheese is extremely easy and only requires 5 ingredients! It's a delicious dairy-free alternative to traditional parmesan. Pulse all ingredients together in a food processor until it becomes a parm like consistency. Nutrition info is for 1 tsp. I hear you Deborah! I was cheese obsessed all my life. It took me a while to get there but eventually I have either found or created tasty enough alternatives that I don’t miss diary cheese anymore. Let me know what you think Annmarie! It doesn’t taste exactly like dairy parm but my husband and I are obsessed so it tastes good even if it’s not exactly the same lol. Yum! What a good substitute! I have to admit, cheese is one of my great loves and is also why I am not vegan. I know I eat too much of it though, and appreciate a good sub every once in awhile! Oh yum! i Have some nooch in the cabinets and am always looking for new ways to use it!! Let me know if you try it Sam! Oh genius! I have only used hemp seeds, garlic, and nutritional yeast as a topping. Can’t wait to give it a try. Thank you for linking up! Thanks so much Sarah! Let me know if you like it! I can totally relate to having to hide things from the husbands! 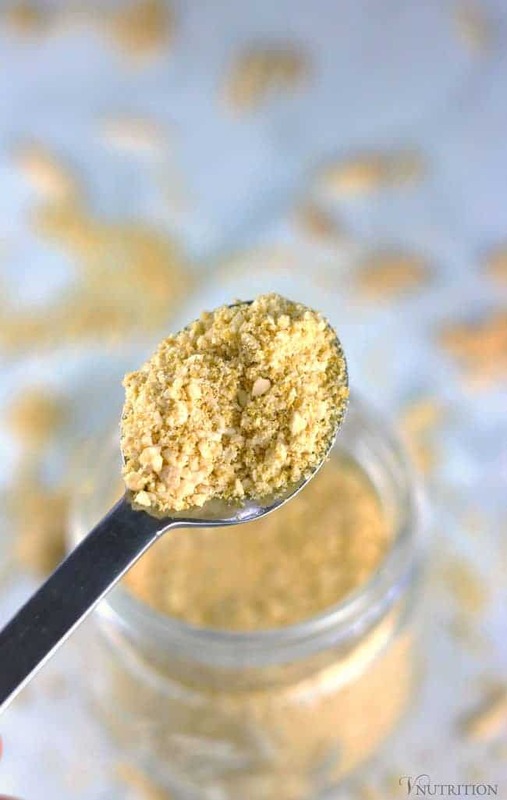 I love nutritional yeast and use it any time I want a cheesy flavor without the “cheese”! I’m glad I’m not the only one Carly! I felt a bit bad writing that I hide stuff from him but it’s the truth lol. What a fantastic idea! You could probably just give this to me with a spoon! lol, I’ve actually done that! This looks wonderful, thanks! Hemp seeds blend into great vegan “parm”. Ooh, I’ll have to try that next! I bet it’s great for those that can’t do this version because of nut allergies. Thanks Christine! 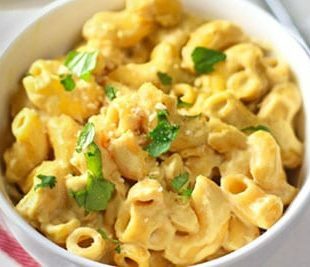 I made a mac & cheese – vegan style before… Without nuts – NUTRITIONAL YEAST is king!! It sure is! I love nutritional yeast! I always forget you can add yeast…looks yummy! Thanks Lauren! I’m obsessed with it to add a little cheesy flavor. I feel bad hiding it from him but I have to do what I have to do lol! Let me know if you try the vegan parm Kyra! I actually hide things often and I sometimes feel a bit bad – but I need to or I wouldn’t have anything to eat lol! I’m glad I’m not the only one either. Yum! 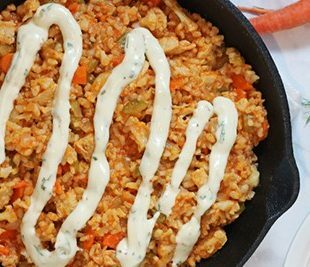 This is what every vegan kitchen needs to kick things up a notch! Thank you for sharing your easy to make Vegan Parmesan recipe with us at the Healthy Happy Green Natural Party! I’m Pinning and sharing! 1/4 what of nutritional yeast? cup? Hi Barbara, yes it should say 1/4 of a cup. I’m surprised no one (including me) caught that before! Thanks for letting me know! I have updated the recipe. I don’t feel at all guilty for hiding things from K: on Saturday, he managed to trough his way through most of the truffles I made… which I hadn’t had a chance to photograph. I had to make some more yesterday, and he now has strict instructions to not touch them until I’ve shot them. Part of me is tempted to leave the photography until tomorrow or Wednesday… but that would be a bit cruel, wouldn’t it? Is there an alternate nut for the raw almonds? I have a food allergy to them. Hi Aileen, I’ve never tried another nut but pine nuts might work or maybe Brazil nuts. If you do try another nut let me know how it out turns out and I can make a note in the directions. I’ll try something else soon too. Everyone should try this it is amazingly tasty I keep going back for more even when the meal is over. Well done on this recipe we loved it.